Sometimes I’m “on the road” without leaving home . . .
“Maggie” in my play “In the Garden of the Selfish Giant” as interpreted by the Aberdour Players Youth Theatre at the Edinburgh Festival Fringe in Scotland, August 9, 2016. 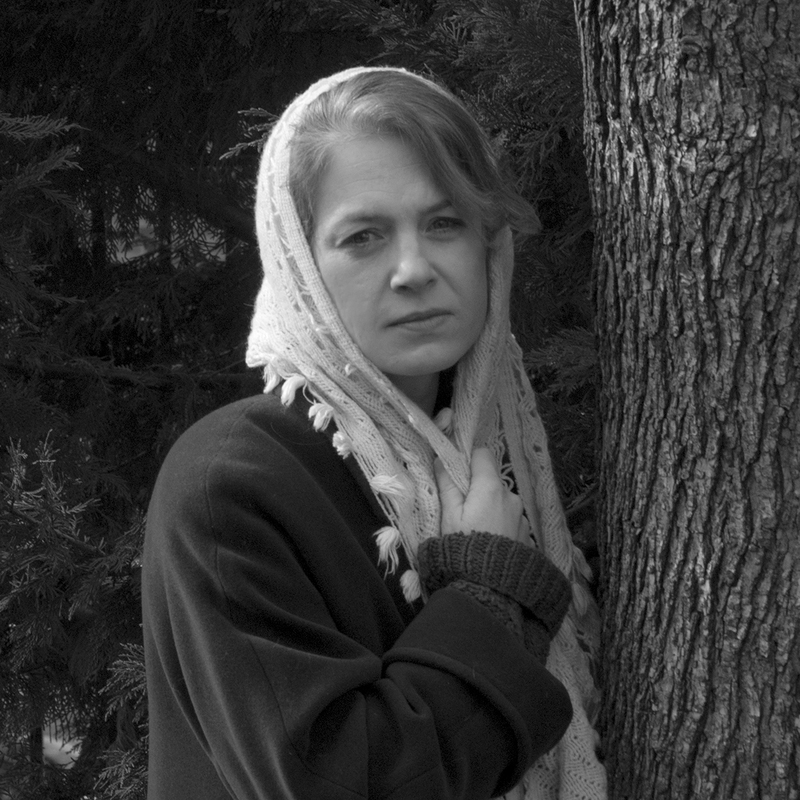 Annie Montgomery as Ilga in my play “Walking Toward America,” which set a record of six performances at the 2015 United Solo Festival in NYC, September – October, 2015. Encore performances of “Walking Toward America” will be presented at Springfield Contemporary Theatre in Springfield, MO, on January 5 – 14, 2018. See http://springfieldcontemporarytheatre.org for more information. 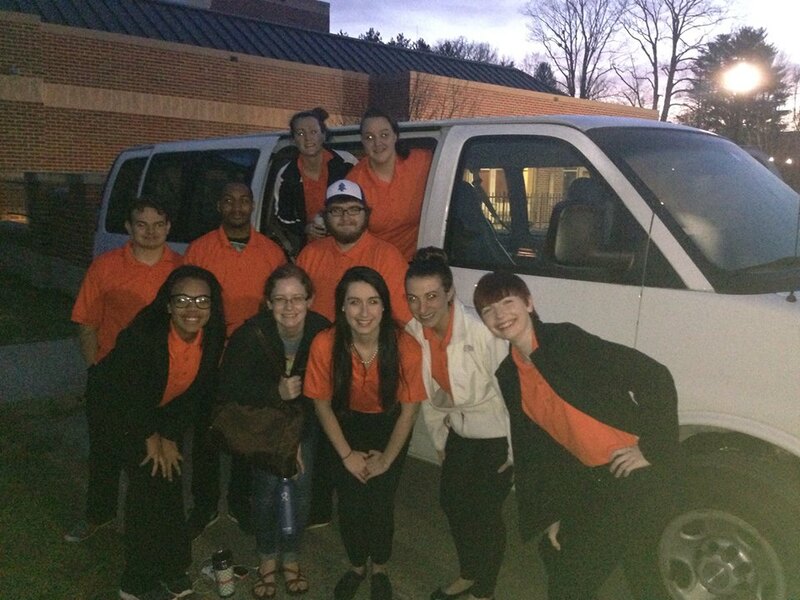 Students at West Virginia Wesleyan University take off on their tour of “The Wolf and Its Shadows,” April, 2015. 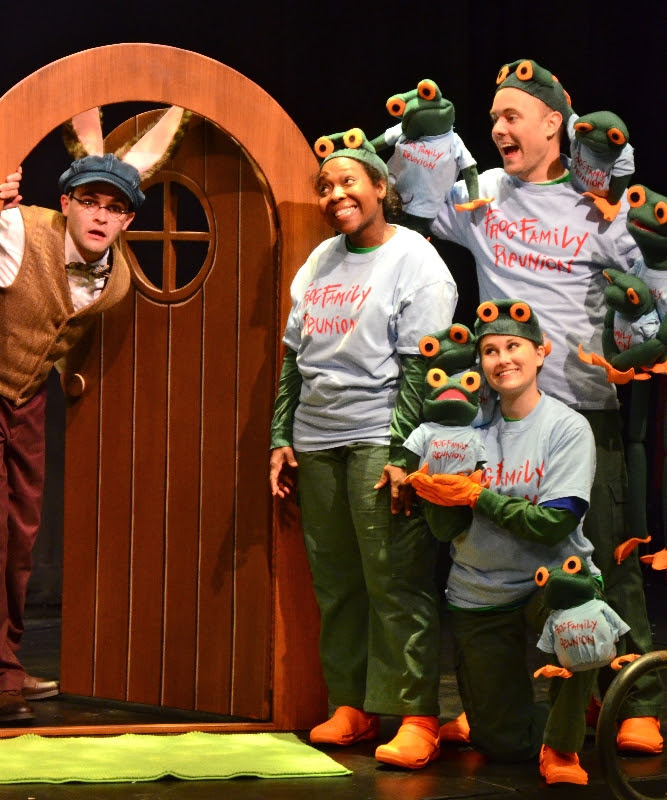 Here are the Children’s Theater of Charlotte’s Tarradiddle Players touring their production of “Too Many Frogs” in southeastern states during the 2013-2014 school year. Here’s a link to a recent blog interview by Adam Szymkowicz: http://aszym.blogspot.com/2017/08/i-interview-playwrights-part-977-sandy.html?spref=fb. I’m #977 in his planned total of 1000 playwrights! And here’s an earlier email interview by Lindsay Bandy on PennPoints, the blog of the Society of Children’s Book Writers and Illustrators’ Eastern PA chapter: http://easternpennpoints.wordpress.com/2014/11/20/a-cafe-chat-with-author-and-playwright-sandy-asher-by-lindsay-bandy/ . . .
And an article after a phone interview by Lancaster newspaper reporter Joan Kern: http://lancasteronline.com/features/all-hail-the-children-s-laureate-city-resident-has-duty/article_9549da1e-b7c6-11e4-94dc-47312c9c8790.html. And an interview in the Lancaster newspaper by Jane Holahan: http://lancasteronline.com/features/entertainment/meet-sandy-asher-who-brings-together-the-stories-of-women/article_8b025012-8674-11e6-a9a0-b757fcb52b57.html. But I do love to travel . . . Demonstrating an “arabesque” while reading STELLA’S DANCING DAYS to first graders at Martin Luther King Jr. Elementary School, Lancaster, PA, my 2018 Authors for Earth Day event. My 2017 Authors for Earth Day (http://authorsforearthday.org) visit to Moreland Hills Elementary School in Cleveland, OH, resulted in a donation in the school’s honor to LaMancha Animal Rescue, Coatesville, PA. Here I am in Portland, OR, in February, 2017, visiting an elementary school with CHICKEN STORY TIME illustrator Mark Fearing. This was the first time I’d ever met one of my illustrators in person — and I couldn’t have asked for a more delightful one to meet! With student writers at Reamstown Elementary, where I met with eighteen K-5th grade classes over several days. 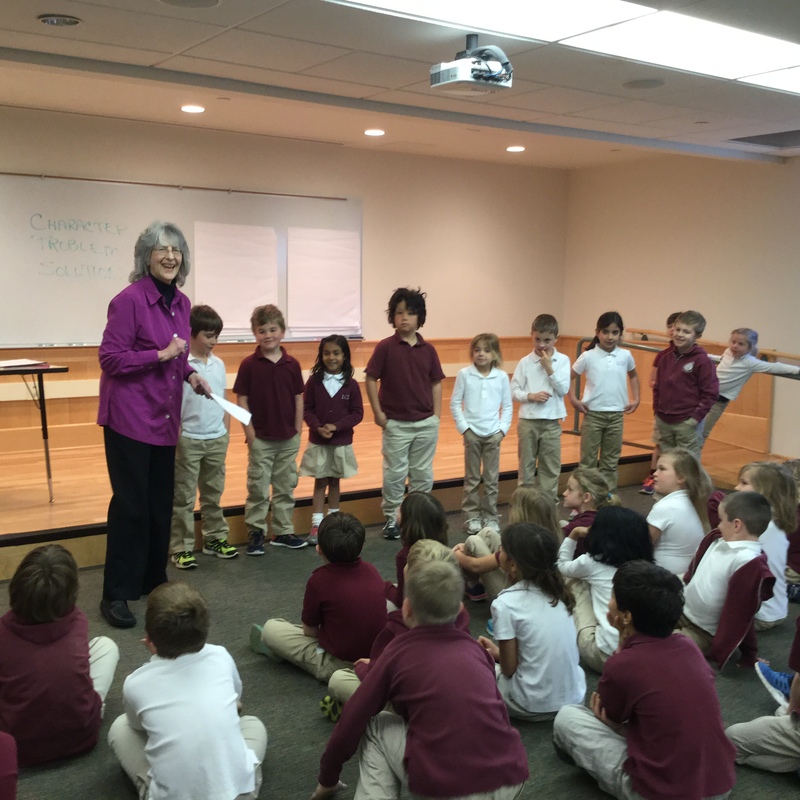 Creating an Add-a-Line Story at Lancaster Country Day School. This was my first “Authors for Earth Day” school visit. Half my fee was donated to an earth-friendly charity voted on by the students, in this case, The Wolf Sanctuary of PA. See more at http://www.authorsforearthday.org. Our official KPETS ID tag photo! In February, 2018, Gracie and I celebrated our one year anniversary as a KPETS Therapy Dog team with Reading Dog visits at Martin Luther King Jr. Elementary School, Carter & MacRae Elementary School, and the Lancaster Public Library. Visits continue throughout the year. February 11, 2018 — Presentation of my Readers Theater piece, “Stand Up for a Child: The CASA Project” at Congregation Shaarai Shomayim, benefitting Court Appointed Special Advocates (CASA) of Lancaster. Here’s a link to the full performance via YouTube: https://youtu.be/eHqbRV3ZQ3Q. March 1, 2018 — Launch date for American Theatre for the Very Young: A Digital Festival, to be hosted on Vimeo. I’m co-chair and recipient of a developmental grant from the Children’s Theatre Foundation of America in support of this exciting new project. View more than a dozen performances from all across the country for free at https://vimeopro.com/atvydigitalfestival/festival. Enter the password TVYDIGFEST. March 13, 2018 — Skype visit with theatre students at Eastern Michigan University. March 13, 2018 — Life story-sharing workshop for New Choices Career Development, Lancaster, PA.
March 18, 2018 — “Growing Up Jewish” story-sharing workshop with students and older congregants, Congregation Shaarai Shomayim, Lancaster, PA.
April 23, 2018 — Life story-sharing workshop in Lancaster County Prison for New Choices Career Development’s New Beginnings program. April 27, 2018 — My annual Authors for Earth Day visit, this time with kindergarten, first, and second grade students at Martin Luther King Jr. 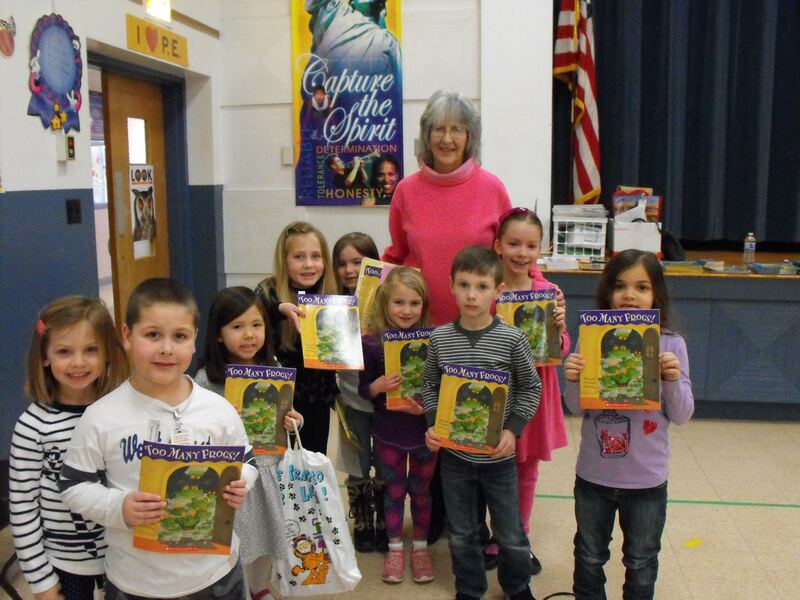 Elementary School, Lancaster, PA. See http://authorsforearthday.org. May 4, 2018 — Presentation of my Readers Theatre piece, “For We Were Strangers in the Land,” at the Ware Center, Lancaster, PA, begins at 7:30 p.m. Donations to Church World Service of Lancaster appreciated. May 5 – 10, 2018 — I’ll be in the Bentonville, Arkansas, area for the tour of CHICKEN STORY TIME by Trike Theatre. Details at http://triketheatre.org. May 12, 2018 — Reading Dog Day at the Lancaster Public Library, 10:30 a.m.
August 1 – 5, 2018 — Attending the American Alliance for Theatre and Education national conference in Minneapolis, where I’ll be presenting a session on American Theatre for the Very Young: A Digital Festival as well as reading a snippet of “Win-or-Lose Stanley” at the Playwrights Slam. August 17, 2018 – Life-story sharing workshop for New Choices Career Development, Lancaster, PA.
September 7, 2018 at 10:30 a.m. and September 8, 2018 at 10:30 a.m. and 2 p.m. — Performances of “Princess Bee and the Royal Good-Night Story” at Lancaster Public Library. Free and open to the public; suitable for preschool and up. Donations accepted to benefit the Lancaster Public Library Children’s Reading Room. September 21, 2018 — First weekly Reading Dog visit of the school year with Gracie at King Elementary School. September 26, 2018 — First weekly Reading Dog visit of the school year with Gracie at Carter and MacRae Elementary School. September 27, 2018 — Life-story sharing writing workshop at Milagro House, Lancaster, PA.
October 31, 2018 — Life-story sharing writing workshop at New Choices Career Development, Lancaster, PA.
November 28, 2018 — class interview visit with 1st graders at King Elementary School. December 10, 2018 — ZOOM visit with Professor John Newman’s Theatre for Young Audiences class at Utah Valley University. They’ll be doing scenes from my play “Welcome Home, Bear!” as their final exam. December 21, 2018 — “Share-a-Story” Day at King Elementary School. I’ll be reading an excerpt from TEDDY TEABURY’S FABULOUS FACT to 3rd and 4th grade classes. January 4 – 6, 2019 — Co-hosting and presenting at American Alliance for Theatre and Education’s symposium, “American Theatre for the Very Young: A Digital Series Goes Live!” at the Ware Center, Lancaster, Pa.
January 19, February 16, March 16, April 27 — Reading Dog Days with Gracie at the Lancaster Public Library, 10:30 a.m.
February 7, 2019 — A visit to King Elementary School with director Anne Meeder to introduce 1st graders to “Welcome Home, Bear!” and get them started making flowers and other props that will be used in the April 5 – 6 performances. February 12 – March 19, 2019 — I’ll be teaching an on-line course on writing plays for young audiences for the Dramatists Guild Institute. Class meets via ZOOM on consecutive Tuesday evenings, 8-10 p.m., EST. March 1, 2019 — “Read Across America Day” at Carter and MacRae Elementary School. April 5 – 6, 2019 — Performances of “Welcome Home, Bear!” at the Lancaster Public Library. Free and open to the public, but space is limited. Register here: https://lancasterpubliclibrary.org/event/welcome-home-bear/. April 7, 2019 — Encore reading of “For We Were Strangers in the Land” at Tellus360. Details here: https://www.tellus360.com/gatherings/event/for-we-were-strangers-in-the-land/.